Complimented with written and practical skill assessments throughout the course to ensure thorough understanding of principles and practices, the 8 hour Confined Space course will allow the Entrant, Attendant, or Supervisor to safely and confidently understand and evaluate the hazards and procedures associated with confined spaces. The course will address the hazards associated with confined spaces and it will outline the duties and responsibilities of all members of a confined space entry team, emergency rescue procedures, and plan development. In addition to confined space entry procedures and hazards, this course will discuss the need for appropriate personal protective equipment and the selection characteristics and pre-entrance testing for each level of protection. Documentation will be provided to the student to satisfy due diligence and local regulation compliance. This course meets the criteria for accepted practices in OH & S training (CAN/CSA Z 1006-10), the highest standard in the industry. Practical Component – Participants will enter a simulated confined space to acquire hands on experience following all safety procedures and checks. Student safety is monitored during training exercises. 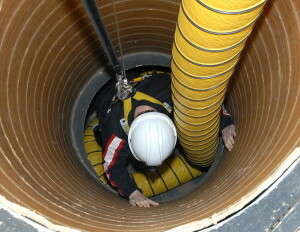 View our Confined Space training photo gallery!